Here is another Shakespeare Tarot and this one is for the true fans. It merges the works of William Shakespeare with the art of the Renaissance. The collages are often beautiful, sometime readable. I’m afraid only people familiar with all the plays may identify the cards. 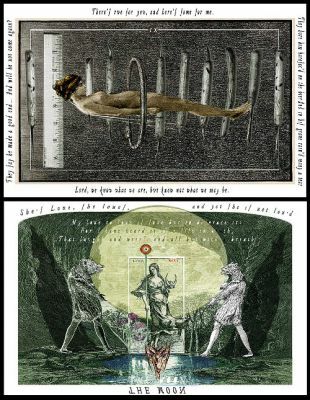 The ones shown here are the 9 of sword (Ophelia, a character from Hamlet) and the Moon (Venus and Adonis from a narrative poem). The Canadian artist Chris Leech had chosen to set all the cards horizontally. This rare feature for a pack of cards had helped him to set properly the scene that emulate a stage. It adds also another challenge for the player. This pack of 78 large cards had been partially financed in the crowdfunding web site Indigogo. ll cards and text can be seen on the artist web site. Price and where to find: The price is US$ 50 +pp for all the cards, in wxw.shakespearetarot.com. The book adds US$ 25.